Wendi Murdoch became an unlikely heroine after launching an astounding defence of husband at the phone-hacking hearing. She leapt to her husband’s defence after a protestor flung a foam pie in his face and attempted to punch the 80-year-old. But Jonnie Marbles couldn’t quite land his blow before Murdoch’s 43-year-old wife raised her arm and launched herself at the activist. Marie Claire asked body language expert Judi James what was behind the strike. Many were surprised at the former volleyball champion’s actions, but as she struck Marbles down she certainly sent out a clear message to Murdoch’s critics – that she and her husband were going to put up a fight. More though than just her husband’s defender though, Murdoch’s third wife has been very successful in her own right. 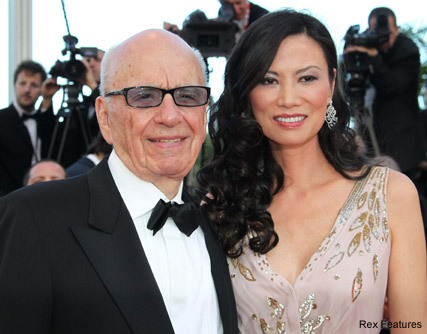 She has an MBA from Ivy League university, Yale, where she studied business and has frequently played an important role in Murdoch’s business in China. She is now a film producer. The couple met in Hong Kong in 1997 and bonded over a shared passion for business. After this week’s events, however, it looks like Wendi might be taking charge and showing herself as a true alpha female. Find out more about the secrets of body language from Judi James’ The Body Language Bible.